Prepare for hard disk disasters before they happen. If you knew that torrential floodwaters were headed right for your house, threatening to rip it out from under you, what would you do? You’d probably prepare for it by putting out sandbags to form a makeshift dam to protect your house and then head for the hills where you’d be safe. If you live in California, your house is probably reinforced to withstand an earthquake if (or rather when) one hits. People who live in hurricane zones have escape routes planned in case they need to evacuate. It just makes sense to prepare in advance for an emergency. As a systems administrator, you should look at another form of emergency preparation, Executive Software’s DiskAlert. DiskAlert may not be able to save you from a tornado or rampaging floodwaters, but it certainly has its advantages in the server room. 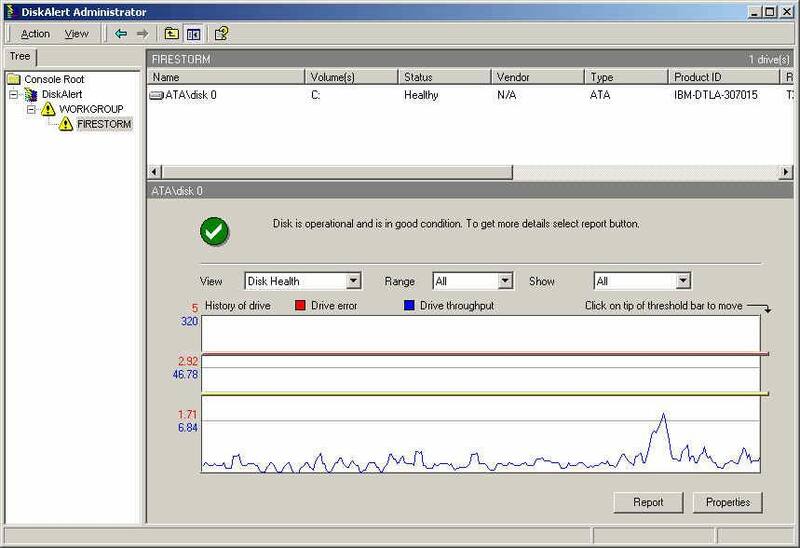 DiskAlert is designed to detect hard disk problems before they become a disaster (i.e. the disk fails) and warn you about the problem so you can prepare. How does it do this? The first thing that comes to mind is the industry-standard S.M.A.R.T. (Self Monitoring and Reporting Analysis Tool) technology, but this is only a small part of it. S.M.A.R.T. is great, but it’s also proprietary; each hard disk vendor has its own implementation, so it’s hard to write a tool that works for all hard disks. DiskAlert uses proprietary algorithms in combination with information retrieved from the hard disk to give you a picture of the hard disk’s health. One of the things DiskAlert tells you is how healthy your drive is, based on throughput of the drive. It also monitors disk space and warns you when the drive is getting too full (or close to it). When a problem is detected, DiskAlert lets you know in a variety of ways. Of course, the standard e-mail and send messages are available, but Executive Software went out of its way and gave DiskAlert the ability to call your cell phone and play a message that you record when it reaches an alert threshold. There’s no doubt that there’s a problem when you hear your own voice on the line telling you there’s an issue! There are only two small drawbacks to this software. First, it runs as a service. This isn’t a big issue but it means that DiskAlert will only run on Windows NT/2000. The second issue is something more general to keep in mind. I (like most) do way too much stuff with my server. I have SQL Server, Crystal Enterprise, Visual Basic, and scores of other memory or disk intensive applications. In my environment I had a performance setback with DiskAlert, not a major one mind you, but it was noticeable. The way around this is to set the polling interval to longer than one minute (about 15 minutes is OK on my machine, which keeps the load on the server to a minimum. Overall, Executive Software set out to create a tool that would help administrators keep their disks running at top efficiency and it definitely delivered. If you want to prepare in advance for disaster, rather than wait until it strikes, then you need this tool.